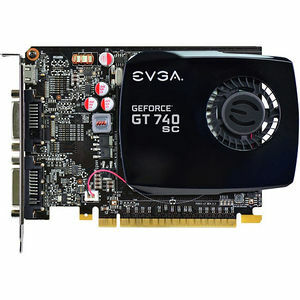 Accelerate your entire PC experience with a new EVGA GeForce GT 740 graphics card. Enjoy all your videos and pictures at HD resolutions, with 10X faster video editing, 13X faster photo editing, and 9X faster web browsing compared to integrated graphics. Plus, experience 4X faster gaming performance that makes all your gameplay richer and smoother. You can even tap into GeForce Experience to automatically get the latest drivers and optimize game settings with a single click. The EVGA GeForce GT 740 is everything you love, a whole lot faster.